And, voice picking is the ideal solution for refrigerated and freezer environments. The ‘hands-free and eyes-free’ benefits of voice picking are readily apparent when workers with cold or gloved hands no longer have to have to handle and interact with paper & pencil or the handle, screen & keys on an RF scanner device. 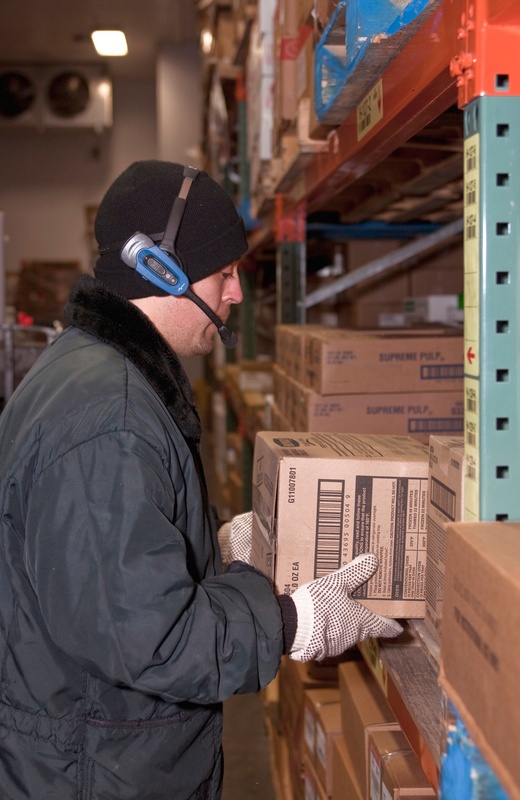 According to Food Logistics, the order picking function within distribution center uses more labor - between 40% and 60% of the total - than any other. This is why voice-directed work solutions are most commonly applied initially to picking. Because a voice-directed worker does not need to interact paper & pencil or the handle, screen & keys on an RF device, all their physical motions are productive and their eyes and focus are able to remain on their picking task. As a result, picking productive and accuracy are both increased and optimized. The result: significant reductions in picking labor and operating costs. And, because voice systems guide workers step by step through their tasks, they are easy to use and easy to learn how to use. New or temporary workers can be trained to pick with voice in just hours versus days with other methodologies. The result: meaningful reductions in training labor and operating costs. One of the added benefits of implementing a voice-directed work solution is that it creates an opportunity for workflows to be examined so that bottlenecks and redundant or inefficient processes can be identified and addressed. And, while picking is the workflow where most companies begin with voice, many companies have voice-enabled additional applications. Some have gone “door to door” - from receiving to loading, and every major workflow in between - with voice. See voice-directed work in action here. And, read how one dairy company is optimizing its distribution center performance by utilizing voice in multiple workflows. So, why wait? Voice can be integrated with any host system – whether it be a basic order management system, ERP system or WMS to deliver the results described above. Engage an expert total solution provider today to optimize your Food & Beverage distribution center operation with Vocollect voice.